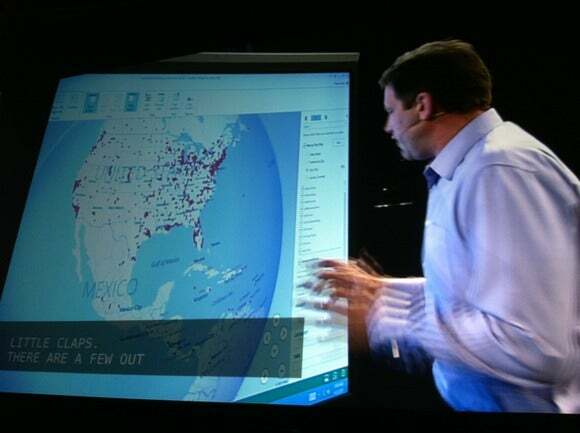 , At TechEd North America 2013, Microsoft demonstrates Project GeoFlow, an Excel add-on that can visualize geographic data. “If you step back and [see] what is fundamentally happening in the industry, the definition of the operating systems is changing and expanding. Its role is to provide an abstraction layer between the application and the hardware, but it has to do that at the scale of the data center or the cloud, not at the level of the individual server,” said Brad Anderson, Microsoft’s corporate vice president of Windows Server and System Center, in a press conference that followed the opening keynote. Many of the features make these products work with Microsoft’s Azure cloud service, or a company’s in-house cloud service, more handily. For instance, Windows Server 2012 R2 can accelerate the speed of VM (virtual machine) live migration. Through the use of de-duplication technologies, the migration process can only move those bits that are unique to each VM, saving the time of copying the parts of a VM that are identical across all instances. It also uses the RDMA (remote direct memory access) protocol to further cut migration time. The Hyper-V Recovery Manager is another new Microsoft service. It runs as a service on Azure, though organizations can use it to manage in-house VMs. If the administration’s primary system goes down, the administrator can use the service to start copies of the VMs that reside elsewhere. “Disaster recovery has never been this easy,” Woolsey said. Windows 8.1 will also come with a new way to send documents to printers, through use of NFC (near field communication). McDonald was the unfortunate presenter this year to be plagued with the nonworking demonstration that always seems to haunt keynotes, Microsoft’s in particular: He attempted, but was unable, to show how the NFC printing would work. But McDonald had plenty of other new Windows 8.1 features to share. It will offer the ability for other devices to tether to a Windows 8.1 device’s Internet connection. On the administration side, the live tiles on the new interface can now be locked down by administrators, which can be handy for work computers with fixed tasks. The company is preparing a Windows Embedded 8 Industry version, which will offer additional administrative capabilities for workplace usage. With Visual Studio 2013, developers now can test their applications in the cloud, using the same set of configurations they might have on-premises. Visual Studio 2013 will also come with a feature called “Head’s Up Display,” according to Microsoft technical fellow Brian Harry. “Head’s Up Display” provides a set of in-line annotations for each block of code, showing when it was last modified, and by whom, if it had passed the last round of testing, and other pertinent bits of information. Team Foundation Server 2013 will provide more information for development project managers. It will offer a collaboration space where team members can share notes. It will feature “hierarchical backlogs,” that offer detailed and summarized views of how a project is progressing, including the backlog of features, who is working on them and how the work is progressing. Microsoft revealed a bit of acquisition news in the developer realm as well. It is acquiring InCycle Software’s InRelease business unit, which provides a way to manage developer workflows of creating new software from development to production.